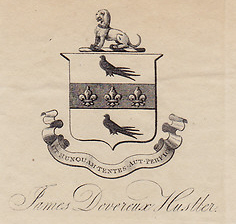 There is a bookplate on sale at eBay belonging to James Devereux Hustler. Arms: Argent on a fesse Azure between two martlets Sable three fleurs-de-lis Or. Crest: A talbot sejant Argent gorged with a collar Azure charged with three fleurs-de-lis Or. Cambridge University Alumni, 1261-1900 shows that Rev’d James Devereux Hustler was the elder son of Thomas and Ann Hustler of Bury St Edmunds, Suffolk, born 4 Dec 1784 and died 1846. He had a son James Devereux Hustler born 17 May 1827 died 1906. The Arms were originally granted to Sir William Hustler of Acklam Hall in 1726. However, none of Sir William’s sons produced any children. Acklam Hall and the Arms descended via his daughter with her descendants changing their name to Hustler by Royal Licence (see pedigree below). The most recent generation bearing the Hustler Arms quartered with those of Hopkins. From what I have found so far, it seems that the Rev’d James Devereux Hustler was not “lawfully” using the Hustler Arms. A victim of a Georgian “bucket shop” perhaps?